When this card is sent from the field to the Graveyard, add 1 monster with 1500 or less ATK from your Deck to your hand. ..
Each time this card destroys an opponent's monster as a result of battle and sends it to the Graveyard, inflict 500 points of damage to your opponent's Life Points. Also, each time either player activ.. When this card is destroyed by battle and sent to the Graveyard, Special Summon 1 Plant-Type monster from your Graveyard, except "Lord Poison". ..
During battle between this attacking card and a Defense Position monster whose DEF is lower than the ATK of this card, inflict the difference as Battle Damage to your opponent. 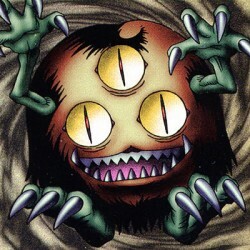 ..
Activate only when your opponent's monster declares an attack. By removing from play this card in your Graveyard, make the Battle Damage taken by ''Gazzelle the King of Mythical Beasts'' or ''Phantom .. If you're Tributing a ''Phantom Beast'' monster or ''Gazelle the King of Mythical Beasts'', this card can be Normal Summoned with 1 Tribute. When this card destroys a monster by battle, inflict 500 da.. When a Trap Card is activated, you can return this face-up card from the field to its owner's hand. ..
Once per turn, while you control another ''Six Samurai'' monster with a different name, you can destroy 1 Set Spell or Trap Card. This monster cannot declare an attack during the turn this effect is u..
Once per turn, while you control another ''Six Samurai'' monster with a different name, you can destroy 1 face-up Spell or Trap Card. This monster cannot declare an attack during the turn this effect .. While you control another ''Six Samurai'' monster with a different name, this card can attack your opponent directly. If this card would be destroyed, you can destroy another ''Six Samurai'' monster y.. While you control another ''Six Samurai'' monster with a different name, this card attack twice during the same Battle Phase. If this card would be destroyed, you can destroy another ''Six Samurai'' m.. While you control another ''Six Samurai'' monster with a different name, destroy any monster this card attacks at the end of the Damage Step. If this card would be destroyed, you can destroy another '.. While you control another ''Six Samurai'' monster with a different name. If this card attacks a face-down Defense Position monster, destroy the monster immediately with this card's effect without flip.. When this card is Normal Summoned, Flip Summoned, or Special Summoned, you can add 1 ''Blaze Accelerator'' Spell Card from your Deck or Graveyard to your hand. ..